Katie Bouman Helped Create the Black Hole Image. You Know What Followed. Women at the forefront of scientific achievements continue to be targets of trolling and misogyny online. Katie Bouman. Credit: Facebook. Image of black hole courtesy Event Horizon Telescope Collaboration. New Delhi: The first direct image of a black hole was celebrated as a significant scientific and technological knowledge. But the trolling of Katie Bouman, a researcher who helped create the image, showed that women continue to be harassed online and face barriers that prevent their contributions from being recognised. 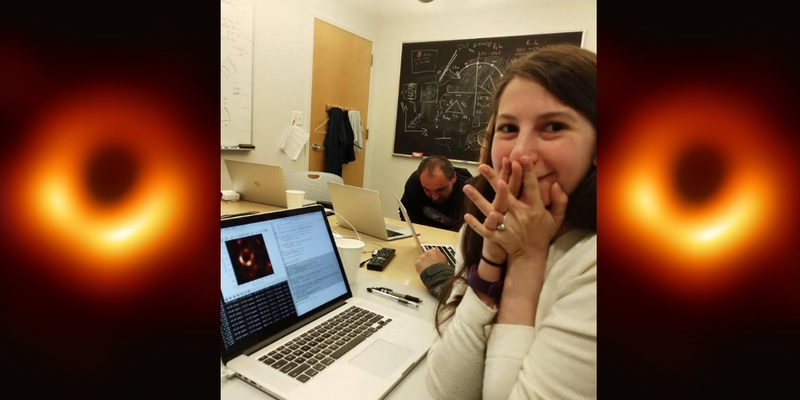 Soon after the photo of the M87 black hole went viral on social media on Wednesday, Bouman also gained internet fame. A photo of the 29-year-old researcher was circulated over Twitter, Facebook and WhatsApp together with notes recognising her role in obtaining the image. This led many to believe that she was solely responsible for the image’s creation, though in reality, 215 people were part of the project. Bouman also clarified in a Facebook post that “no one algorithm or person made this image”. However, trolls soon began advancing false claims that she did not have “much of a role” in the project. On Reddit, YouTube and Instagram, several users claimed that it was a male colleague who deserves the credit for the image instead. While Bouman’s colleagues have since come to her defence, the incident highlights the trolling and misogynistic comments that women face on the social media that attempt to diminish their contributions. According to NBC News, by Friday, falsehoods surrounding Bouman’s role in the project overtook “legitimate coverage in search results on YouTube and Instagram”. Twitter users pointed out that the top search result for “Katie Bouman” on YouTube was a video titled “woman does 6% of the work but gets 100% of the credit”. Reports said the video is inaccurate and is based on falsehoods pushed by a “men’s rights” community. YouTube later corrected its algorithm and the top search result now is a video of Bouman delivering a TED talk. The inaccurate video claims that Andrew Chael, a “straight white male”, did most of the work. The assertion was based on a number of publicly available lines of code published on the Github repository. Responding on Twitter, Chael, an astrophysicist who has worked with Bouman, called the theory theory “awful and sexist”. He also clarified that he was in fact gay. While rumours claimed that Chael had written 850,000 lines of code, the Harvard University graduate student said there were only 68,000 lines of code in the software’s current version. He added that he was thrilled Bouman was being recognised for her work and that she was inspiring people as “an example of women’s leadership in STEM”. “I’m also thrilled she’s pointing out that this was a team effort including contributions from many junior scientists, including many women junior scientists,” he said. A YouTube spokesperson told NBC that the platform was working to “change its system to value authoritative content”. We’ve taken a number of steps to address this including surfacing more authoritative content across our site for people searching for news-related topics, beginning to reduce recommendations of borderline content and showing information panels with more sources where they can fact check information for themselves,” the spokesperson said. Becca Lewis, a research affiliate at Data & Society, a nonprofit research institute, also told the channel that the incident proves YouTube’s algorithm rewards engagement and time spent on the site to “maximise advertising revenue” instead of facts. On Instagram too, the top search for “Katie Bouman” was an account impersonating her. According to reports, it was created late on Thursday night and makes false claims about her. The incident highlights the vitriol female scientists face on the social media, but should also serve to remind that their bad experiences aren’t restricted to such platforms alone. For example, studies have found that papers with female first authors receive 10% fewer citations than comparable papers with male first authors. A paper published in 2013 found that reviewers who were assigned abstracts ostensibly written by females or males rated male authors with greater scientific quality. When scientists analysed peer-review scores for postdoctoral fellowship applications in Sweden, they found it to be “riddled with prejudice”. Women were also given lower competence ratings than men who had less than half their publication impact. In 2017, when three scientists won the Nobel Prize for the first direct detection of gravitational waves, Popular Science pointed out that 1,011 people had been involved in the experiment. It listed their names, calling them the “legion of unsung”, while also drawing attention to how the prizes help the deleterious myth of the ‘lone genius’ persist. But as The Verge argues, highlighting the role of a female scientist in such a historical project showcases “a different model for a scientist than the one most of us grew up with”. It is also why movies like Hidden Figures are required to highlight the contributions that three black women – Katherine Johnson, Dorothy Vaughn and Mary Jackson – made during the “space race”.